Laraaji & Lyghte - Celestial Realms. Vinyl LP. Bleep. Morning Trip is a new sub-label of Telephone Explosion (Bruce Haack, Steve Roach), and they’ve scored themselves one hell of a record to kick things off. 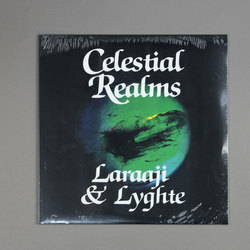 Laraaji & Lyghte first released Celestial Realms back in 1986. With Laraaji’s stock pretty high off the back of a Brian Eno co-sign he could have been forgiven for trying to fit his spiritual zither music into more linear, pop-oriented structures. However, doing so didn’t appear to interest him much, and this collaboration with Lyghte (Jonathan Goldman) yielded a pair of longform new age meditations. Bells, guitar, zither and synth cascade over the thick drones of ‘Equinox’ and ‘Celestial Realms’. Originally a cassette-only release, this Morning Trip edition sees Laraaji & Lyghte’s opus set to vinyl.